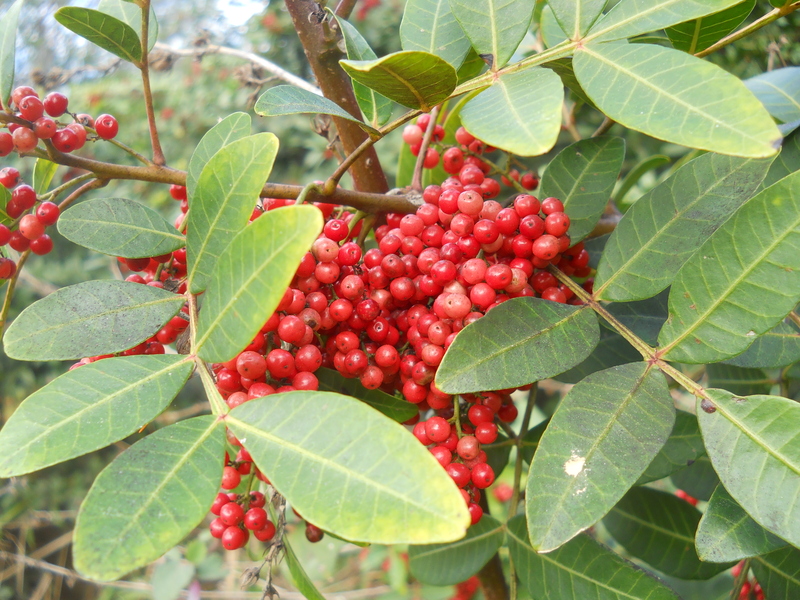 In a new study published this week in the journal Scientific Reports, scientists found that an extract from the berries of the invasive Brazilian peppertree plant can disrupt signaling among methicillin-resistant Staphylococcus aureus bacteria. MRSA, known as a superbug, has become a growing concern in hospitals in recent years since many available antibiotics can’t kill it. In 2011, MRSA killed over 11,000 people. In the United States, people are not accustomed to the idea of dying from infections. This sounds like a thing of the past, something out of Oregon Trail. But with increasing numbers of antibiotic-resistant bacteria emerging, these occurrences have become more and more common. And the solution may be surprisingly old. The Brazilian peppertree has become a nuisance in some places in the United States, especially Florida, where officials have designated it an invasive species. But the shrubby tree has also been a crucial component of Brazilian traditional medicine for hundreds of years, used “for its antiseptic and anti-inflammatory qualities in the treatment of wounds and ulcers as well as for urinary and respiratory infections,” write the authors of this new study. They also note that scientists have used extracts from the plant’s bark to kill several pathogens, including the non-resistant form of S. aureus. The plant’s traditional uses, along with scientific evidence, led the researchers to test the plant’s extract on MRSA. The researchers of this new study have thrown their hats into the ring to help fight the growing antibiotic resistance problem, and they tried something different. They examined a traditional medicine, and what’s more, they didn’t try to kill the MRSA bacteria. Instead, they used a plant extract to disrupt the bacterial cells’ ability to communicate among themselves. This renders them unable to release the toxins that cause serious infection, essentially disarming them. The added bonus of this treatment is that since it doesn’t kill bacteria, but simply keeps them from excreting their nasty toxins, a person’s immune system is left to fight off the infection. Because the treatment doesn’t aim to kill the bacteria, the researchers hope that it won’t contribute to the growing problem of antibiotic resistance. Perhaps other researchers can learn from this study. The cost of developing antibiotics is prohibitively high, and often they become useless in less time than it takes companies to develop them. Maybe by reaching back into the pharmacopoeias of old, scientists will be able to discover ancient solutions to our new problems. Widespread antibiotic resistance is on the rise and current therapies are becoming increasingly limited in both scope and efficacy. Methicillin-resistant Staphylococcus aureus (MRSA) represents a major contributor to this trend. Quorum sensing controlled virulence factors include secreted toxins responsible for extensive damage to host tissues and evasion of the immune system response; they are major contributors to morbidity and mortality. Investigation of botanical folk medicines for wounds and infections led us to study Schinus terebinthifolia (Brazilian Peppertree) as a potential source of virulence inhibitors. Here, we report the inhibitory activity of a flavone rich extract 430D-F5 against all S. aureus accessory gene regulator (agr) alleles in the absence of growth inhibition. Evidence for this activity is supported by its agr-quenching activity (IC50 2–32 μg mL−1) in transcriptional reporters, direct protein outputs (α-hemolysin and δ-toxin), and an in vivo skin challenge model. Importantly, 430D-F5 was well tolerated by human keratinocytes in cell culture and mouse skin in vivo; it also demonstrated significant reduction in dermonecrosis following skin challenge with a virulent strain of MRSA. This study provides an explanation for the anti-infective activity of peppertree remedies and yields insight into the potential utility of non-biocide virulence inhibitors in treating skin infections.